Deciphering the metabolome is essential for a better understanding of the cellular metabolism as a system. Typical metabolomics data show a few but significant correlations among metabolite levels when data sampling is repeated across individuals grown under strictly controlled conditions. Although several studies have assessed topologies in metabolomic correlation networks, it remains unclear whether highly connected metabolites in these networks have specific functions in known tissue- and/or genotype-dependent biochemical pathways. In our study of metabolite profiles we subjected root tissues to gas chromatography-time-of-flight/mass spectrometry (GC-TOF/MS) and used published information on the aerial parts of 3 Arabidopsis genotypes, Col-0 wild-type, methionine over-accumulation 1 (mto1), and transparent testa4 (tt4) to compare systematically the metabolomic correlations in samples of roots and aerial parts. We then applied graph clustering to the constructed correlation networks to extract densely connected metabolites and evaluated the clusters by biochemical-pathway enrichment analysis. We found that the number of significant correlations varied by tissue and genotype and that the obtained clusters were significantly enriched for metabolites included in biochemical pathways. We demonstrate that the graph-clustering approach identifies tissue- and/or genotype-dependent metabolomic clusters related to the biochemical pathway. Metabolomic correlations complement information about changes in mean metabolite levels and may help to elucidate the organization of metabolically functional modules. Combining and integrating different 'omics' data such as transcript-, protein-, and metabolite levels and enzyme activities is essential for a full understanding of the nature of the cellular metabolism as a system [1–4]. With respect to transcript levels, a large amount of microarray data is publicly available for Arabidopsis thaliana, a model plant. Such large datasets facilitate the construction of gene co-expression databases  and the survey of transcriptome organization [6–8]. Integrating transcript- and metabolite data by, for example, studying the correlation relationships among profiled data, facilitates the characterization of unknown gene functions, and furthers our understanding of plant cellular systems [9–11]. The correlation between variables (e.g. genes and metabolites) is also important for multivariate statistical analyses such as principal component analysis (PCA) and hierarchical cluster analysis. Typical metabolite-profiling data show a few, but significant correlations among metabolite levels when data sampling is repeated across individuals grown under strictly controlled conditions . The metabolomic correlation as well as gene co-expression are not always in agreement with known biochemical pathways. Metabolomic correlation approaches have highlighted some properties (e.g. modularity and scale-freeness) in several species including plants [13–16]. Steuer et al. , who provided a relationship between the structure of a metabolomic-correlation network and a metabolic reaction network using a Jacobian matrix, found that the relationship is not simple. They pointed out that small fluctuations such as glucose availability can result in a certain correlation pattern and persist through metabolic pathways. Using metabolic control analysis (MCA) and correlation analysis based on metabolomic data, Camacho et al. suggested that metabolites are strongly correlated when they respond in the same directions to all perturbations (fluctuations) in enzyme levels. For example, mass conservation and chemical equilibrium were suggested as one origin of a high correlation. Muller-Linow et al. applied network similarity, a graph-theoretic parameter, to compare metabolomic correlation networks with biochemical reactions derived from the KEGG database . They reported that these networks were in disagreement and that closeness in metabolomic correlation is not an indicator of closeness in biochemical networks. Studies on the effect of changes in environmental conditions and temporal- and spatial assessments of the topology of metabolomic correlation networks have been reported [19, 21, 22]. Further investigation of the properties of metabolomic correlation networks may discover whether highly connected metabolites, the so-called 'modules', in the correlation network reflect known biochemical pathways. We investigated similarities and dissimilarities in metabolomic correlations in the aerial parts of 3 Arabidopsis genotypes, Col-0 wild-type (WT), methionine-over accumulation 1 (mto1) , and transparent testa4 (tt4) . Elsewhere  we reported that the mutation in cystathionine γ-synthase (CGS) and/or the over-accumulation of methionine (Met) strongly affect the correlation networks in aerial parts of mto1. In the present study, using gas chromatography-time-of-flight/mass spectrometry (GC-TOF/MS), we measured the relative metabolite levels in root samples of the 3 Arabidopsis genotypes to assess tissue- and/or genotype-dependent changes in their metabolite levels. We systematically compared the metabolomic correlations observed in 2 different datasets, the roots and the aerial parts. Multivariate statistical analyses showed the distinct metabolome of these plants and tissues. We then constructed correlation networks by pair-wise correlation between the metabolites and performed graph clustering using the DPClus algorithm  that efficiently extracts densely connected metabolites in a large-scale network. We then evaluated the obtained clusters with KEGG  enrichment analysis. Our results demonstrate that changes in each network topology are tissue- and/or genotype-dependent and that they reflect, at least partially, known biochemical pathways in Arabidopsis. The experimental workflow is shown in Figure 1. Roots of Col-0 wild-type (WT), mto1, and tt4 mutants were sampled and analyzed. We detected 166 metabolite peaks including mass spectral tags (MSTs)  by the GC-TOF/MS-based metabolite profiling we established for Arabidopsis. Of these, 83 were known metabolites including carbohydrates, amino-, fatty-, and organic acids and vitamins, and others were secondary metabolites (Additional file 1). For comparisons with data from aerial parts we selected 59 commonly-detected metabolites in both datasets using MetMask http://metmask.sourceforge.net, a tool for metabolite identifier linking. Outline of the procedure for comparing tissue- and/or genotype-dependent metabolomic correlations in Arabidopsis. Three genotypes [methionine-over accumulation 1 (mto1), transparent testa4 (tt4), and wild-type (WT)] were studied. 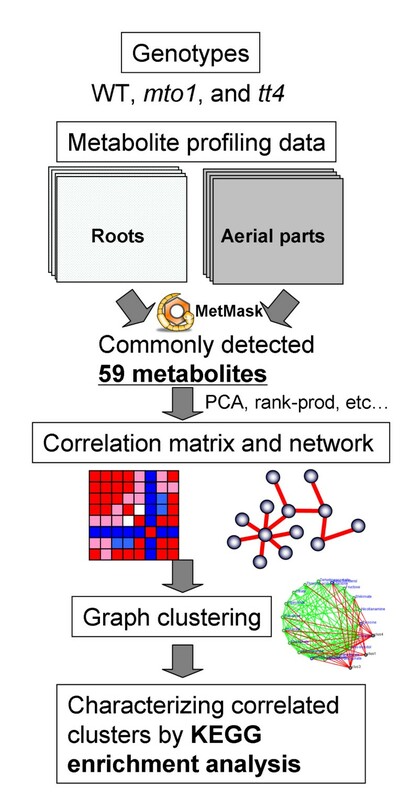 Samples from aerial parts and roots were analyzed by GC-TOF/MS-based metabolite profiling and changes in mean metabolite levels were assessed and calculated by multivariate statistical analysis PCA, the rank product method, and the metabolomic correlations by the Spearman correlation coefficient. Then we constructed the metabolomic correlation networks. Using DPClus  we extracted densely connected metabolites. Lastly, we characterized each cluster based on the KEGG enrichment analysis to assess statistical significance. 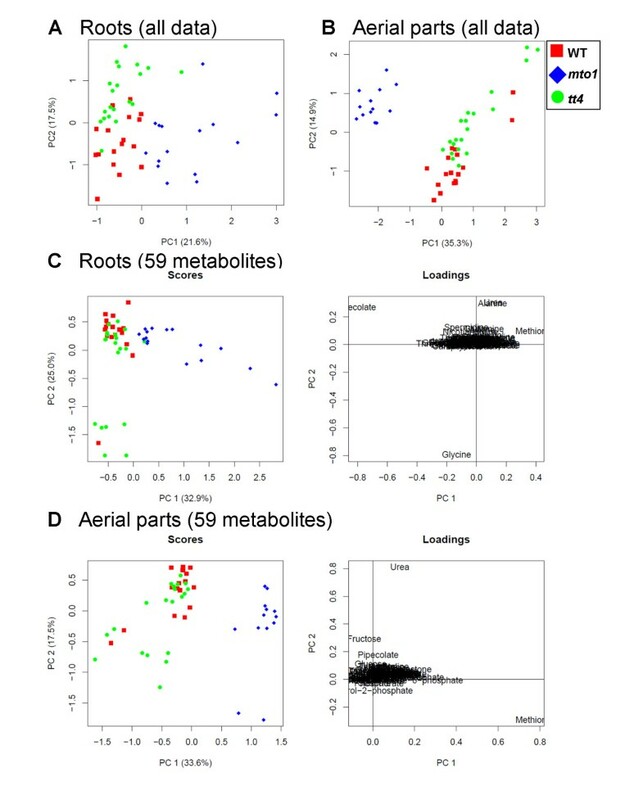 By PCA we visually inspected the metabolite profiles of the roots and aerial parts based on commonly detected metabolites and all peaks (Figure 2). To confirm the most important principal components (PC) of these samples we prepared score plots for each dataset. As in aerial parts, samples of mto1 roots were clearly separated while samples of tt4 roots were close to WT along the second component axis (Figures 2A and 2B). The loading plots highlighted and visualized metabolites with a significant role in genotype separation. For example, methionine (Met), urea, glycine, and pipecolate had a strong impact on the roots and aerial parts of mto1 and tt4 (primarily the first principal component). The complete list of metabolites that contributed to the separation of the mutant profile groups from WT (discriminative metabolites) is shown in Additional file 2. In the PCA score plots of the 59 metabolites, the first principal component (PC1) clearly discriminated between mto1- and the control samples (Figures 2C and 2D). To obtain further insights into the interpretation of our PCA results, we re-calculated PCA by removing the four most influencing metabolites (methionine, urea, glycine, and pipecolate) from the original data matrices. Additional file 3 shows the score and loading plots of roots (A) and aerial parts (B) using 55 metabolite datasets. The PCA plots revealed that asparagine and glutamine strongly contributed to PC1 separation in both the roots and aerial parts (see Discussion). Principal component analyses of the roots and aerial parts of 3 Arabidopsis genotypes. Score scatter plots for roots (A) and aerial parts (B) using all detected peaks are shown. Score and loading plots using 59 commonly detected metabolites for roots (C) and aerial parts (D) are presented. These data include 53 root samples (WT, n = 17; mto1, n = 16; and tt4, n = 20) and 50 samples from aerial parts (WT, n = 17; mto1, n = 13; and tt4, n = 20). Symbols: red squares, wild-type (WT); blue diamonds, mto1; green circles, tt4. Data on the aerial parts were from the work of . To evaluate the correlations among the metabolite profiles observed in each tissue and genotype we calculated the Spearman correlation coefficient (r). The significant correlations (local false discovery rate (fdr) < 0.05; see ref ) for each tissue and each genotype are shown in Figure 3. All resultant correlations are listed in Additional file 4. Statistics of correlation analyses among the 3 Arabidopsis genotypes. (A) Genotype- and/or tissue-dependent correlations and (B) differential correlations between roots and aerial parts are shown. A significance level set at fdr < 0.05, local false discovery rate. fdr was calculated using fdrtool package . The resulting correlations are all listed in Additional file 4. We first examined the number of significant correlations between tissues. We found that the number of significant correlations in WT and mto1 roots was larger than in their aerial parts (Figure 3A); it was also much larger in the aerial parts of tt4 than its roots. Then, we compared differences between correlations in roots and aerial parts using Fisher Z-transformation (see Methods). Similarly, we also compared differential correlations between genotypes. The number of statistical differences between correlations in roots and aerial parts in WT, mto1, and tt4 was 7, 8, and 21, although there were no significant changes in the correlations between genotypes except for 6 differential correlations between WT and tt4 in roots (fdr < 0.05) (Figure 3B and Additional file 4). Our findings imply that in both tissue-types, the mto1 mutation strongly affects the metabolomic correlation network, and that there are many correlations intensified by a lack of the chalcone synthase (CHS) gene. Our observations also suggest that the tendency for changes in the number of significant correlations is similar within the studied tissues of the 3 genotypes. For visualization and to gain insights into the metabolomic correlations for each tissue and genotype we constructed correlation networks. The selection of an appropriate threshold is important for the construction of such a correlation network, if it is too high the generated network will be sparse, if too low, only a large connected component will be produced. To assess threshold-dependent changes in the network topology we computed 6 graph-theoretic measures (Additional files 5 and 6), i.e., the graph density, clustering coefficient, average degree, average path length, number of connected components, and the number of edges (for example, see ). We also compared the statistics of the real data and 100 randomized data (dots in Additional files 5 and 6). We observed that the number of connected components showed a transition from small to large at a correlation threshold of 0.5 (arrows in Additional file 5). Therefore, we set the threshold at r ≥ 0.5. Although a threshold does not guarantee explicit biological significance, we found that examining various statistics among the constructed networks was useful for selection. At r ≥ 0.5, DPClus  identified 5, 5, and 4 clusters in the metabolomic correlation network for the root samples of WT, mto1, and tt4, respectively; they ranged in size from 6 to 29 metabolites. For the aerial parts of WT, mto1, and tt4 we obtained 5, 7, and 5 clusters, respectively; they ranged in size from 4 to 34 metabolites (Additional file 7). We posit that this difference in the number of clusters reflects differences in the network topology, which, in turn, is tissue- and genotype-dependent. To assess the significance of the clusters we used the over-represented KEGG pathways (so-called KEGG enrichment analysis) in the obtained- and randomized clusters (see Methods and Table 1). The results of graph clustering with KEGG enrichment analysis for mto1 roots are presented in Figure 4. Our findings on the other genotypes are listed in Table 2; they are visualized in Additional file 8. The clusters obtained with the graph clustering method involved the enriched KEGG pathway and included the 'alanine-, aspartate-, and glutamate metabolism' (p = 0.0021) in mto1 roots (Figure 4). The statistical relevance of this approach was evaluated with the S-value  that can be used for assessing the significance of the clustering results based on KEGG pathways (see Methods). As shown in Figure 5, the averaged best p-value for significantly-enriched KEGG pathways was better in real- than randomized data. a is the number of metabolites in the KEGG pathway belonging to the DPClus cluster, a+b indicates the total number of metabolites in the KEGG pathway, a+c the number of metabolites in the DPClus cluster, and n the total number of metabolites in the profiling data. Rows reflect presence/absence within the KEGG pathway. Columns contain each of the 2 DPClus clusters. For each KEGG pathway the metabolites belonging to the 2 comparison groups are shown. Graph clustering of metabolomic correlated modules in mto1 roots (threshold r ≥ 0.5). Using the DPClus algorithm  we extracted 5 clusters in mto1 roots. The significant metabolic pathways were assigned by KEGG enrichment analysis (see Methods). The central graph consisting of 5 blue clusters and 10 red edges was extracted by DPClus. Each blue cluster contains densely connected metabolites (see Clus1 to 5). Small white nodes in the clusters indicate metabolites. Clus1 (top, left) shows the first cluster of the hierarchical graph. The internal nodes of the clusters are connected by green edges; neighboring clusters are connected by red edges. Both c p and density values, DPClus parameters, were set to 0.5. We used overlapping-mode in DPClus settings. The results obtained in the other 2 genotypes are shown in Additional file 8. Assessment of statistical significance in the resulting metabolomic clusters in mto1 roots using DPClus. The best p-values for the KEGG pathways, averaged over all clusters (S-score; see Methods), were compared with the corresponding values of 100 randomly generated clusters (grey histogram). 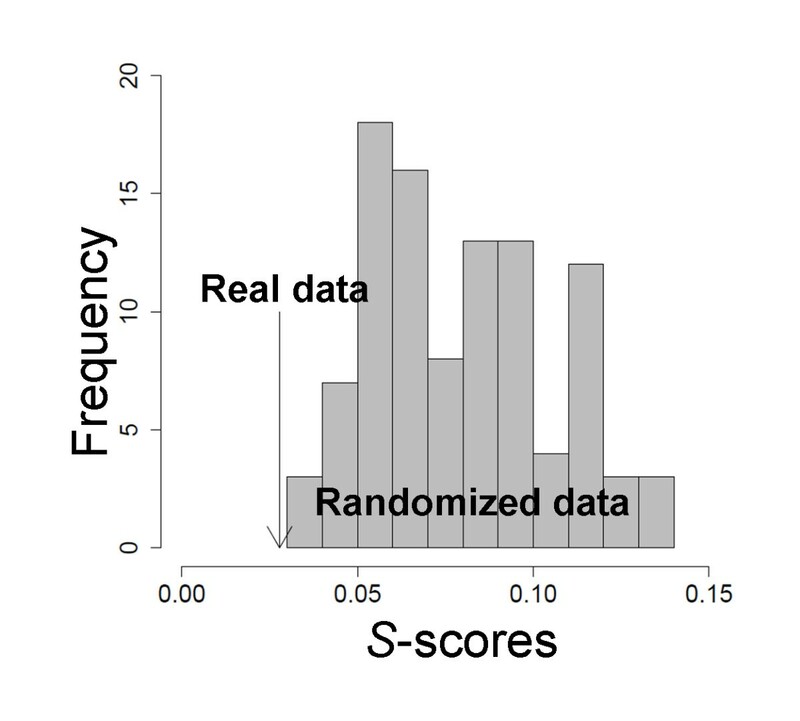 The averaged S-score (black solid arrow) was 0.0278, indicating that real- scored significantly better than randomized data. Except for the clusters found in the aerial parts of WT and mto1, the detected clusters tended to include steroid biosynthetic pathways (Table 2). The strong correlation between sterols confirmed our earlier observations for aerial parts . Metabolites belonging to fatty-acid biosynthesis tended to cluster together. The clusters we commonly found in the aerial parts of the 3 genotypes were galactose metabolism. The largest cluster for the aerial parts and roots of mto1 were 'alanine, aspartate, and glutamate metabolism.' This suggests that the mutation resulting in Met over-accumulation can affect the metabolic pathway of the aspartate family. Metabolite enrichment analysis using other mto mutants also extracted the same pathways . The largest cluster in the roots of tt4 was 'biosynthesis of alkaloids derived from the shikimate pathway.' For both tissues, tt4, which lacks the gene encoding CHS , showed less pronounced changes in the metabolite levels belonging to this biosynthetic pathway (see Discussion and Additional file 2). We focused on the changes in the topology of metabolomic correlation networks of 3 Arabidopsis genotypes (WT, mto1, and tt4). When comparing the WT, the increases and decreases in the number of significant correlations for mto1 and tt4 were similar in their aerial parts and roots. 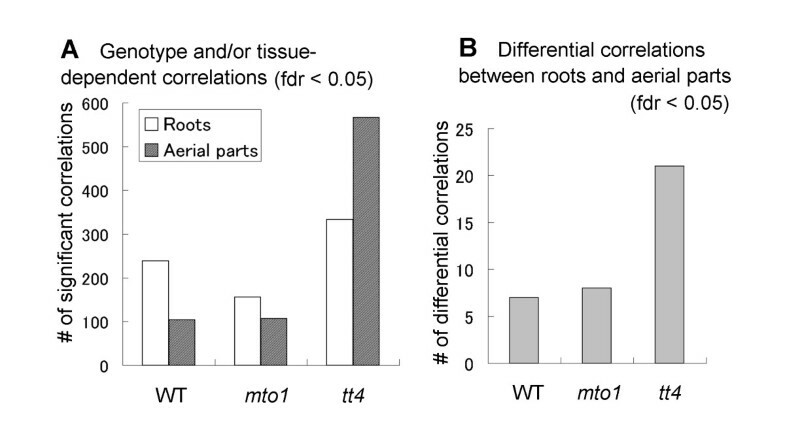 Our comparative studies showed strongly altered metabolomic correlations in the roots of mto1. As did Kusano et al. in aerial parts, we observed a marked increase in the number of significant correlations in the roots of tt4 compared to the roots of WT. As our study imposed no environmental perturbations on the 3 genotypes, we suggest that the observed changes in the topology of metabolomic correlation networks are attributable to underlying tissue- and/or genotype-dependent biochemical regulations. 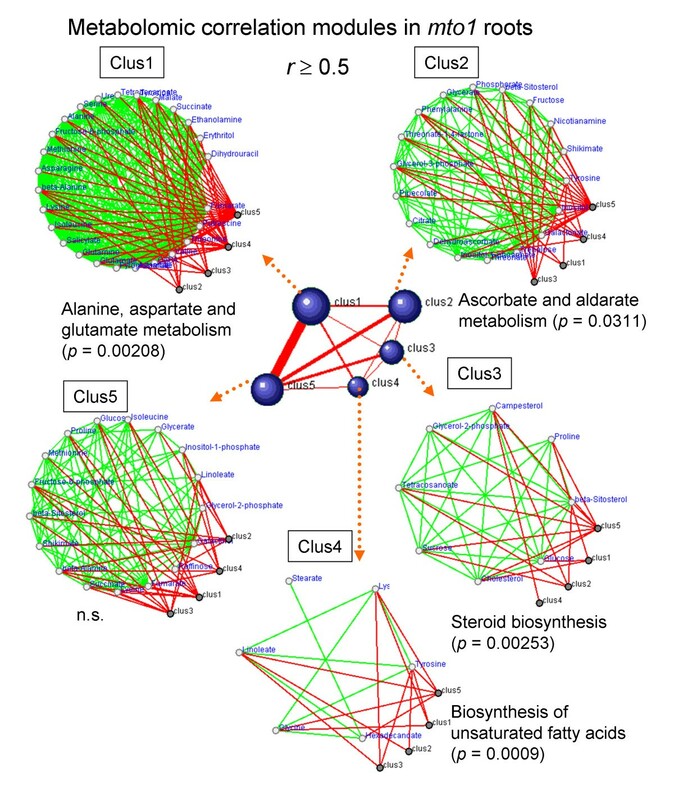 Graph clustering using DPClus  yielded densely connected metabolites on the metabolomic correlation networks. KEGG enrichment analysis to assess the statistical significance of the detected clusters demonstrated specific differences in the clusters in the enriched pathways. We posit that the assigned KEGG pathways for each cluster reflect differences in underlying genetic properties and in tissue- and/or genotype-dependent biochemical regulations. The largest cluster in mto1 roots was assigned as the'alanine, aspartate, and glutamate metabolism'. Since mto1 mutants are characterized by mutations involving the aspartate pathway, the approach based on graph-clustering proved itself useful for characterizing genotypes. Although there were no significant enriched KEGG pathways in cluster 5 in Figure 4, this cluster may represent the extensive coordination among biosynthetic pathways involved in glycolysis, the tricarboxylic acid (TCA)-cycle, and stress-responsive metabolites in mto1 roots. Our approach may yield new insights into the organization of metabolites in the functional pathways of a given organism. In tt4 roots, the largest cluster was 'biosynthesis of alkaloids derived from the shikimate pathway'. This cluster contained metabolites associated with the biosynthetic pathways of the TCA cycle and with glycolysis because this KEGG pathway covered extensive pathways from glycolysis to alkaloids via shikimate for the biosynthesis of aromatic amino acids including phenylalanine, tyrosine, and tryptophan. The mutation in the CHS gene appears not to affect the biosynthesis of alkaloids in Arabidopsis. We posit that the model plant Arabidopsis lacks the production of complex alkaloids, although homologues for many enzymes associated with alkaloid biosynthesis have been detected in its genome . Our multivariate statistical analysis suggests that the mutation of CHS may influence nitrogen assimilation (Additional file 3). Furthermore, the third cluster (Clus3) in tt4 roots was significantly enriched for metabolites contained in 'nitrogen metabolism' (Table 2), suggesting that our approach may reflect underlying changes in the metabolism by lacking of CHS in Arabidopsis. Taken together, our observations demonstrate that variations in the topology of correlation networks are tissue and/or genotype-dependent and reflect at least partially known biochemical pathways in Arabidopsis. Earlier studies indicated that the interpretation of metabolomic correlations requires careful evaluation [12, 17, 18]. Our work demonstrates that graph clustering can be used to gather metabolites belonging to the metabolic pathways that change in response to different regulations that in turn are dependent on the tissue and/or genotype. Our analyses differ from those of  in that we examined the densely connected metabolites in the correlation network by statistical KEGG enrichment analysis instead of using network similarity or proximity. Graph clustering approaches have been effectively applied to gene co-expression networks for extracting functional, densely connected genes [6, 33–35]. We showed that the approach is also effective for metabolomic correlations. Although we only evaluated 3 genotypes, the approach based on graph clustering seems to be useful and applicable to the monitoring of changes in the topology of correlation networks. As in the gene co-expression analysis that involves thousands of microarrays, there were few negative correlations in this study. For instance, the number of significant negative correlations (r < 0 and fdr < 0.05) in the roots and aerial parts of WT was 17 and 6, respectively. Therefore, we deliberately did not use negative correlations. Other similarity measures such as mutual information  and partial correlation , instead of Spearman correlation coefficients, may be applied in this approach. Further studies are necessary to assess to what extent these measures affect the graph clustering results of metabolomic correlation networks. There are few systematic comparisons of metabolomic correlations among time series data . Temporal and spatial assessment of the topology in the metabolomic correlation network may contribute to the development of novel data-mining methods and to the discovery of biomarkers . There are also few published systematic metabolomic comparisons under stress conditions. Szymanski et al. demonstrated that the correlation network approach can help to identify stress-dependent regulatory mechanisms in Escherichia coli. Our current report is a logical extension of our continued effort to understand the regulation of the primary (especially Met biosynthesis ) and the secondary (especially flavonoid biosynthesis ) metabolism in Arabidopsis. Our approach contributes to the generation of new testable hypotheses for further experiments and may expand our fundamental understanding of the metabolic behaviors affected by genetic and/or environmental perturbations. Such information will contribute to the characterization of unknown gene function(s) and help in the high-throughput screening of metabolic phenotypes ranging from experimental models to crops  and disease studies . This study demonstrated that (1) differences in mutations and/or tissues affect changes in the topology of metabolomic correlation networks; (2) graph clustering yields tissue- and/or genotype-dependent metabolomic clusters related to respective biochemical pathways; and (3) metabolomic correlations complement information on changes in mean metabolite levels and the approach based on metabolomic correlations yields insights into the organization and regulation of metabolic modules. For metabolomic correlation analysis we sampled tissues from the roots of Arabidopsis thaliana Col-0 wild-type (WT), methionine over-accumulation 1 (mto1) , and transparent testa4 (tt4) . Data on the aerial part were from . The number of biological replicates in roots was 53 (17 × WT, 16 × mto1, and 20 × tt4). We pooled 3 root samples as a batch for metabolite profiling. As described in , each sample was extracted, derivatized, and analyzed by GC-TOF/MS. Briefly, we pre-processed all raw data using custom MATLAB software (version 6.5; Mathworks, Natick, MA, USA) for hyphenated data analysis (HDA) ; it performs baseline correction, peak alignment, and peak deconvolution. For metabolite identification we used the Golm Metabolome Database (GMD) [27, 43] and our in-house mass spectral libraries. Metabolomic data were log2 transformed and then statistically analyzed using the rank product method  to identify differentially changed metabolites with the Bioconductor 'RankProd' package. Significantly changed metabolites showed a false discovery rate (FDR) < 0.05. The FDR value in the rank product was obtained with 1,000 random permutations. PCA was performed with the Bioconductor 'pcaMethods' package . To reduce outlier-related artifacts, the Spearman rank correlation (r), which is relatively robust to outliers and is based only on monotonicity, was used for comparative metabolomic correlations. The statistical significance of the correlation coefficient (r) was tested against the hypothesis of no correlation (r = 0) according to t-statistics: , where n shows the sample size. where r1 and r2 are the correlation coefficient for each of the two tissues (or two genotypes), and n1 and n2 indicate the number of replicates for each of the two tissues (or genotypes) for each metabolite-metabolite pair. The local false-discovery rate (fdr) was determined with the 'fdrtool' package . The significance level was set at fdr < 0.05. All statistical tests were performed with the R program http://www.r-project.org/. To identify co-accumulated metabolite groups we used DPClus , a graph clustering algorithm that can extract densely connected nodes as a cluster. It is based on density- and periphery tracking of clusters. DPClus is freely available from http://kanaya.naist.jp/DPClus/. In this study, we used the overlapping-mode with the DPClus settings because we are confident that extracting clusters with the overlapping-mode is consistent with the overlapping of many of the metabolic pathways and protein complexes. We set the parameter settings of cluster property c p ; density values were set to 0.5. The resulting clusters are listed in Additional file 7. All network statistics such as graph density were calculated in R with the 'igraph' package . To assess the statistical significance of clusters obtained by graph clustering, we subjected datasets of the aerial parts and roots of the 3 Arabidopsis genotypes and 100 randomly-generated sets of clusters to KEGG enrichment. Each randomized cluster was created by permutation of the metabolite names without changing the cluster size. The assessment was done using the S-value : , where n shows the number of clusters and i a cluster. This value is based on the best p-value, p min , for KEGG pathway enrichment in each cluster. The best p-values were averaged over all clusters to provide the S-value. The significance of the KEGG pathway in clusters is represented by the p-value, which shows Fisher's exact probabilities based on two-by-two contingency tables: Table 1 is a 2 × 2 table ("KEGG pathway", "non-KEGG pathway", "within DPClus cluster", "without DPClus cluster") used by Fisher's exact test, where significance is defined as a p-value (obtained from the test for DPClus clusters) that is less than or equal to a pre-set level of significance (p < 0.05). The probability of obtaining any set of values was given by the hypergeometric distribution. A full list of the KEGG pathways used in this study is shown in Additional file 9. The authors thank Dr. Satoshi Naito, Hokkaido University, and Dr. Satoshi Kitamura, Japan Atomic Energy Research Institute, for providing mto1 and tt4 seeds, respectively, Mr. Makoto Kobayashi and Ms. Naomi Hayashi, RIKEN Plant Science Center, for technical assistance, Drs. Keiko Yonekura-Sakakibara and Takayuki Tohge, RIKEN Plant Science Center, for discussions, Ms. Ursula Petralia for editing this manuscript, Mr. Tetsuya Sakurai and Mr. Kenji Akiyama, RIKEN Plant Science Center, for computational assistance, and two anonymous referees for their critical reading of the manuscript and their insightful comments. AF designed this research, analyzed the data, and wrote the manuscript. MK analyzed the metabolite profiling and edited the manuscript; HR assisted in chemical identifier linking and edited the manuscript; AF, MK, and MA interpreted the data; MA and KS supervised the project and edited the manuscript. All authors read and approved the final manuscript.